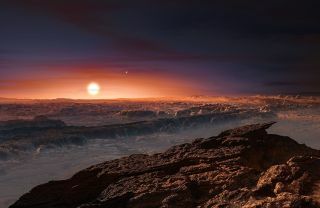 An artist's illustration of the surface of Proxima b, a roughly Earth-size world that orbits the nearby red dwarf star Proxima Centauri. The nearby alien planet Proxima b is not a great candidate to host life as we know it, a new study suggests. Immensely powerful flares from Proxima b's parent star likely stripped some of life's key building blocks from the Earth-size alien world's atmosphere long ago, according to the study, which investigated the life-hosting potential of planets circling the small, dim stars known as red dwarfs. The new study took such characteristics into account, developing a new model of red dwarf "habitable zones" — the range of distances from a star at which liquid water should be stable on a world's surface — that considers more than just a parent star's heat. "By the classical definition, the habitable zone around red dwarfs must be 10 to 20 times closer in than Earth is to the sun," study lead author Vladimir Airapetian, a solar scientist at NASA's Goddard Space Flight Center in Greenbelt, Maryland, said in a statement. "Now we know these red dwarf stars generate a lot of X-ray and extreme ultraviolet emissions at the habitable zones of exoplanets through frequent flares and stellar storms." This is bad news from a habitability perspective. The team's modeling results suggest that such radiation can strip the electrons off molecules in orbiting planets' atmospheres. These electrons escape into space easily, and they drag the newly created, positively charged ions with them as they go. Light elements, such as hydrogen, are lost fairly easily via this process. And superflare radiation can kick the "atmospheric erosion" up a notch, driving off oxygen and nitrogen — key building blocks of life — as well, the new study found. "Considering oxygen escape alone, the model estimates a young red dwarf could render a close-in exoplanet uninhabitable within a few tens [of millions] to a hundred million years," NASA officials wrote in the same statement. "The loss of both atmospheric hydrogen and oxygen would reduce and eliminate the planet’s water supply before life would have a chance to develop." "We have pessimistic results for planets around young red dwarfs in this study, but we also have a better understanding of which stars have good prospects for habitability," Airapetian said. "As we learn more about what we need from a host star, it seems more and more that our sun is just one of those perfect parent stars to have supported life on Earth." The new study was published this week in The Astrophysical Journal Letters.